After you decide on which bicycle you are going to ride, how do you carry all the things you will need for the tour on your bicycle? What’s the best way to carry stuff on a bike? If you know absolutely nothing about bicycle touring, you might think that bicycle travelers carry their belongings (i.e. tools, clothing, camping gear, food, etc) in a backpack. I know that’s what I thought when I started planning my first bicycle tour! But carrying your things in a backpack is not the typical approach for most bicycle tourists. The reason you don’t want to carry your gear in a backpack is because using a backpack is going to make you hot, sweaty and sore! When you spend 4 to 12+ hours a day riding your bicycle, the last thing you want is to have a big heavy bag on your back. It just makes things a whole lot harder! So, instead of using a backpack, there are two main ways you can carry your gear on your bicycle, and thus, eliminate any excess pressure to your back, neck or body. The two main ways that bicycle tourists carry their gear is with the use of panniers and/or a trailer. Panniers are backpack-sized bags that attach to the front and rear racks of your bicycle. They are shaped very much like a small backpack… and a standard touring bicycle can hold up to four panniers (two on the front of your bicycle and two on the back). Therefore, they are capable of carrying a whole lot of gear! A trailer, on the other hand, is a one or two wheeled metal cart that you pull behind your bicycle. Inside the trailer you store your belongings and, like panniers, the weight of your equipment is placed off of your body and onto the frame of your bicycle. Well, this is a topic that’s quite controversial among many bicycle travelers. Some claim that panniers are the best, while others think that trailers are the only way to go. More than 10,000 people filled out that survey and the results indicate that of those who toured in the past, 92% used panniers, 7% used a trailer and only 1% used a backpack. While there is much debate over whether or not panniers or trailers are best, I think the numbers speak for themselves. Panniers are the #1 pick for most traveling cyclists! They place the weight of the gear off your body and onto the frame of your bicycle. They allow you to organize your gear into separate, easy-to-access pockets. They can be waterproof (although not all of them are). They are easy to transport off the bike (on planes, trains, boats and buses). They make your bicycle very compact (which makes it easy to navigate in narrow terrain). They can only be used on bicycles where front and/or rear racks can be mounted. The good ones are kind of expensive. Steering a bicycle with front panniers takes a little getting used to. Most cyclists need 1-3 days of practice riding with front panniers before conducting a long-distance bicycle tour. Learning to pack them correctly takes some training. They are difficult to carry for long distances off the bike. While panniers are clearly more popular in the bicycle touring world, there are some good reasons to use a trailer. Can be used with almost any type of bicycle. Are low to the ground, which makes it easier for you to steer your bike. Are easy to pack because everything is stored in one large container. Are usually (but not always) waterproof. Are usually better than panniers in rough, off-road conditions. It adds 1 or 2 more wheels to your rig. The more wheels you have touching the ground, the more resistance you are creating and the more you are going to have to work to get your bike and gear up and over the hills you are sure to encounter on your travels. They are not easily transported on airplanes, buses, boats or trains. They require you to carry an extra, smaller spare inner-tube for the trailer’s wheel(s) in the event of a flat. And as soon as you attach a trailer to your bicycle, you are suddenly twice as long as you normally would be on a regular bike. As you can see, there are benefits and drawbacks to each method of carrying your gear. That’s why I spend so much time on my website and inside The Bicycle Touing Blueprint, reviewing the different types of panniers and trailers that are available to you… and helping you determine which method of carrying your gear is best in varying circumstances. 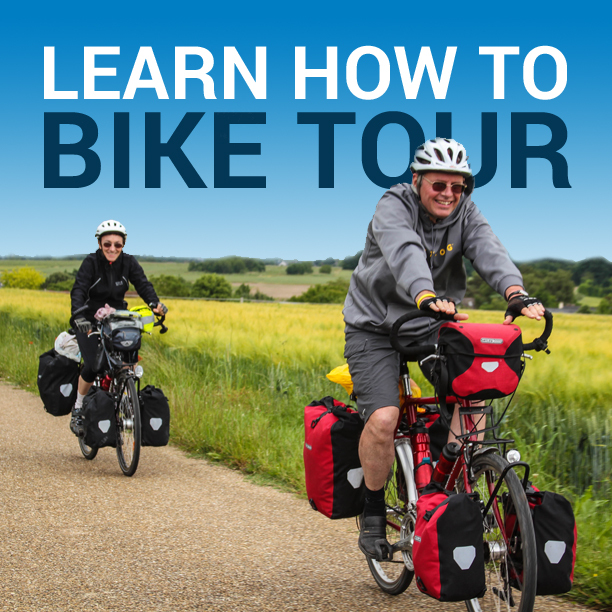 The type of bicycle tour you are conducting, where you are going in the world, how long you plan to be traveling and a whole host of additional factors will ultimately determine which type of bicycle you should be riding, how you need to carry your gear, what to pack, and a whole lot more! This entry was posted in Backpacks, Bicycle Touring Pro Articles, Featured Articles, Featured How-To Articles, Main Articles, Panniers, Products, Trailers and tagged are bike trailers good for touring bikes, are panniers worth the money, best bike panniers, best bike trailers, bicycle panniers, bicycle trailers, bike panniers, can i use a road bike and a trailer, how to carry gear on a bike, how to carry stuff on a bike, Panniers, panniers or trailers, touring bike trailers, trailer, trailers, trailers and road bikes. Hey Darren. What do you think about these panniers? im on a low budget btw. Good article. I was wondering as to your specific reasons for apparently preferring panniers to trailers, and you have good reasoning. I haven’t done extensive touring…I’ve mainly been a commuter type rider, although that is changing. I have both panniers and a trailer, and either will work for me on the rather short rides I have planned in the near future. But you make a good case for panniers for long distance touring.